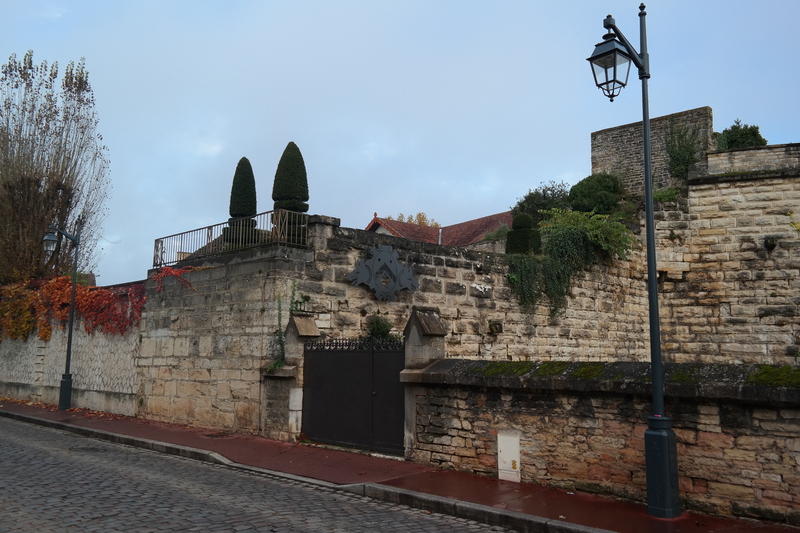 After a good night of sleep (which we needed because the day before was a very long day) we set sail to visit a vineyard in one of Beaune’s most ancient buildings that goes back to Louis XI (15th century) and where thanks to Michel Bouchard there is wine made. 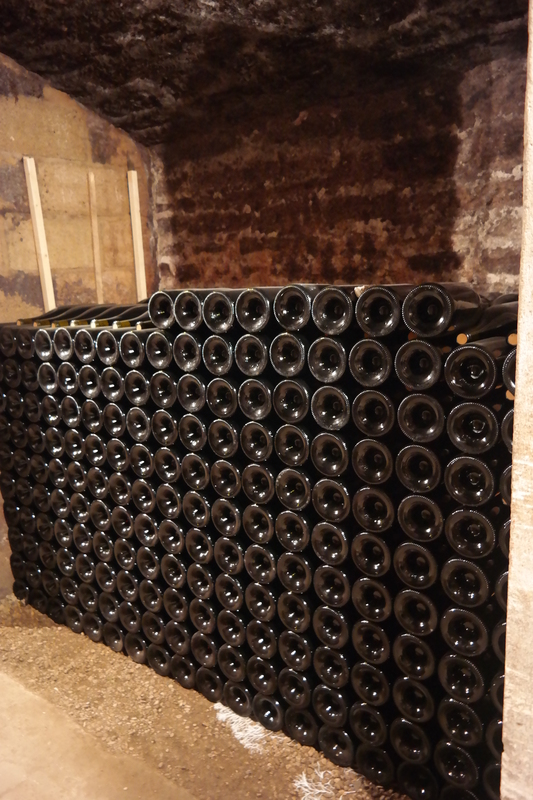 Up to today this vineyard is still family owned with Christophe Bouchard as current General Manager. 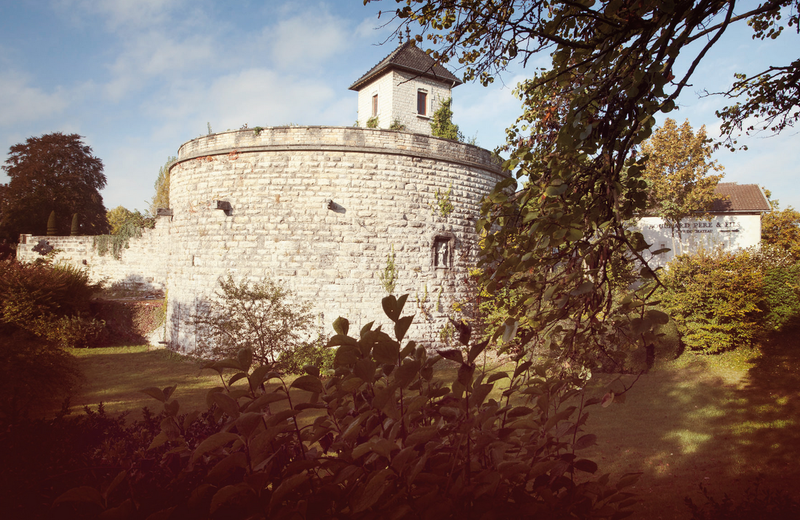 I must add that eventhough the vineyard is still family owned and lead by a Bouchard family member, it is now owned by the Henriot family (who are also owner of Henriot Champagne). Welcome to the Bouchard vineyard I’d say! 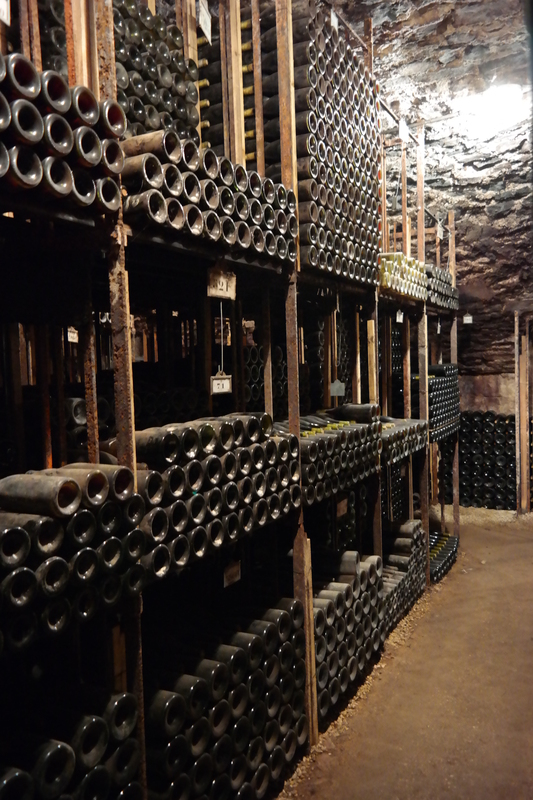 We are in Beaune… for those who didn’t know it yet, we entered the world of Bourgogne/Burgundy wines. Together with Bordeaux, Bourgogneis one of the most spoken about all over the world (mainly the wine world I’m sure). Most wine makers from outside of France either follow the Bordeaux or the Bourgogne methodology to make their wines … so I was really interested in knowing/seeing what was so special about it and what fascinates/attracts all the winemakers to this wine region, but also why they all come here to learn everything about winemaking. First things first. What do you guys need to know about Bourgogne/ Burgundy wines to be able to mingle in when people are talking about this wine region? 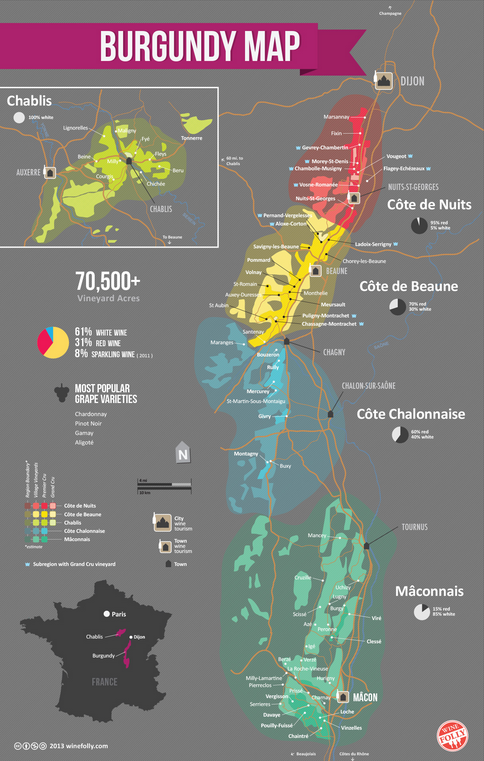 The Bourgogne wine region is located somewhere between Lyon and Dijon in which we can distinguish 4 different departments: Yonne (Chablis), Côte-d’Or (Côtes de Nuits and Côte de Beaune), Saône-et-Loire (Chalonnais en Mâconnais which is next to the Beaujolais (Fleurie) wine region) and last but not least Nièvre. The vineyard from our friends from Bouchard is in the Côte-d’Or which is basically the heart and soul of the Bourgogne wine region. As grapes, they mainly use Pinot Noir for the red wines and for white wines this would be Chardonnay. Sometimes they’ll also blend with other kinds of grape like Pinot Blanc for whites and Gamay Noire or César for the reds. 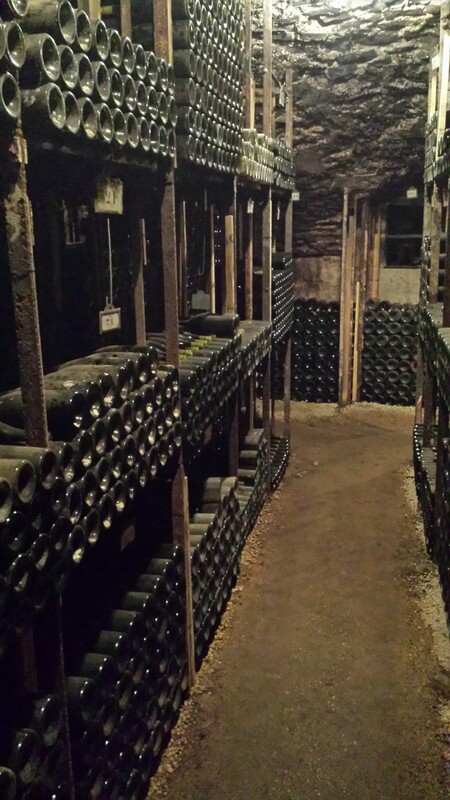 Bouchard mostly sticks to the Pinot Noir and Chardonnay. 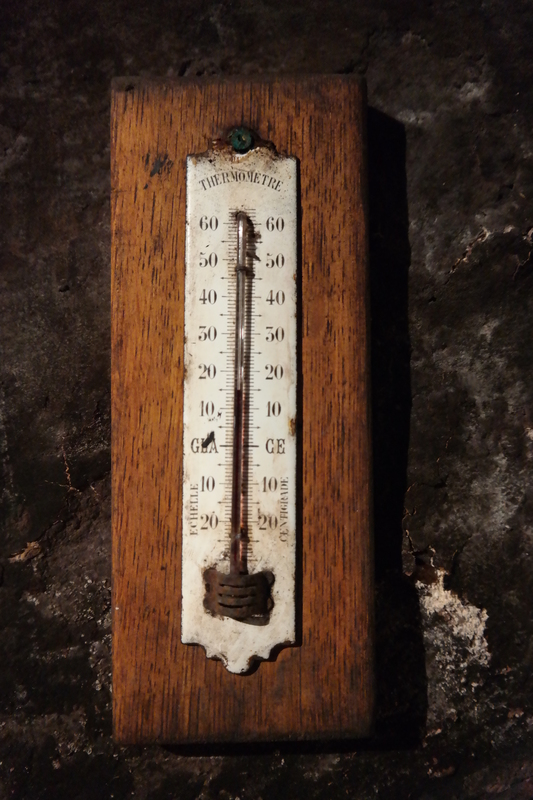 Something that always used to confuse me in the past with French wines was when they started talking about ‘Premier cru’, ‘Grand cru’ and/or ‘Village’… you agree?? The difference between them all is mostly the location of the grapes which leads to either a very affordable or very expensive wine 🙂 (so even in winemaking it is all about ‘location, location, location’). The ‘Grand Cru’ represents the best of the best where the grapes were able to grow in the best conditions (best weather, sunshine, nutrition, etc…) whereas the regular wines aka ‘Appellations Régionales’ in “lesser” conditions (there are obviously more differences, but my example is just generally speaking). Due to the fact that there are not that many grounds/area’s that are considered as ‘’Grand Cru’makes it that it only represents 2% of the total wine volume and therefore are also much more expensive than the ‘Appellations Régionales’ or the’ Appellations Villages’ For example. 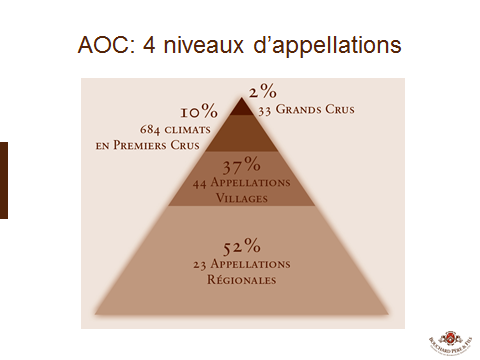 A fact you do also need to take into consideration is that Grand or Premier Cru wines also age much longer (so a bigger investment for the winemaker) Maybe the pyramid below will help you understanding. It is also very possible that for example a particular wine can all 4 gradations of wine of the pyramid. So for example a ‘regular’ Nuits Saint-Georges and a Nuits Saint-Georges 1ière cru 🙂 . To understand the best the difference between them you should just buy all 3 and taste them next to each other… a whole new world will open, I promise! 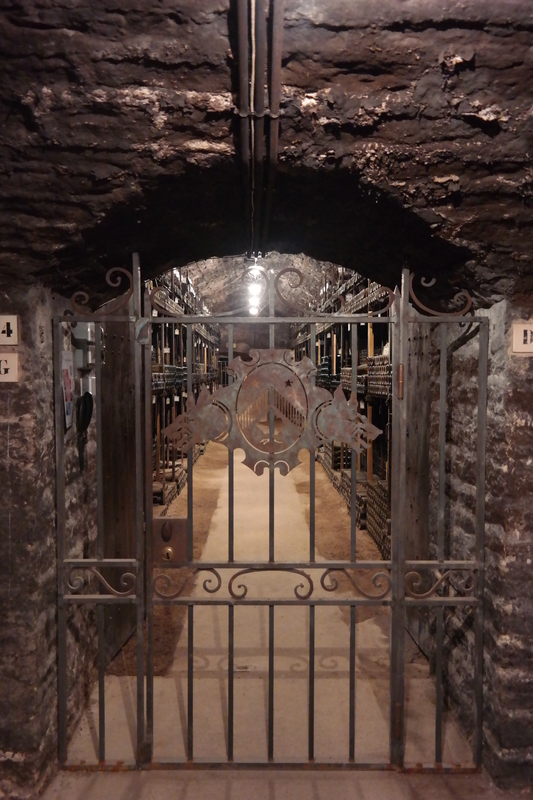 Back to our visit to Bouchard which was basically a walk through history (without some King doing his business behind the curtain in the hallway that is 🙂 (luckily)). 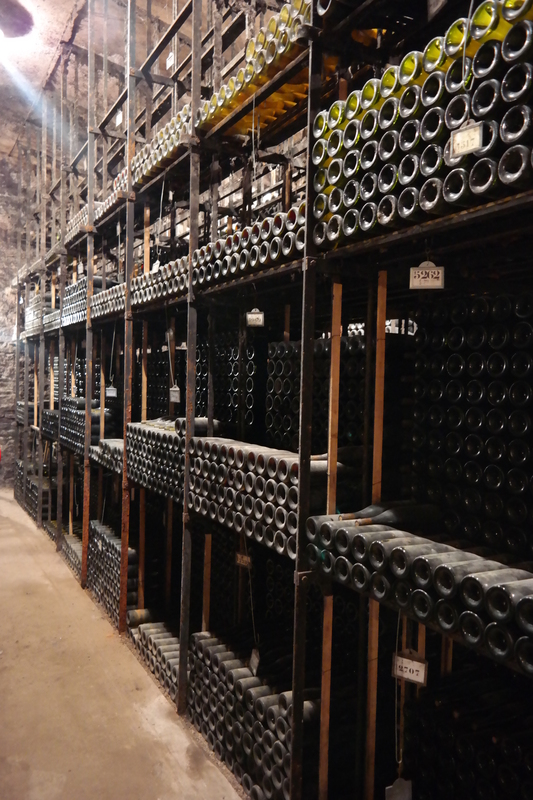 All kidding aside, Bouchard might be one of the most beautiful vineyards I have ever visited and it being in an ancient castle with everything still intact makes it soooo incredible. I was also surprised to find out they still have a few bottles from the 19th century that believe it or not that are still drinkable! 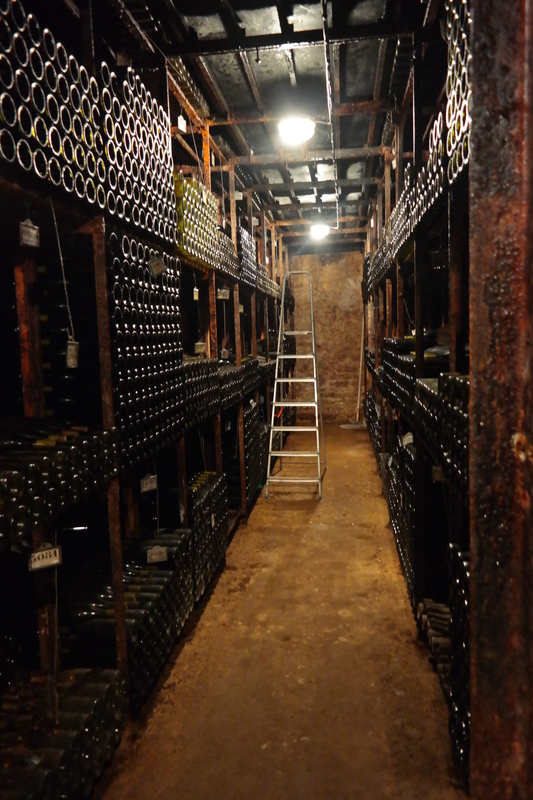 They did admit that not all of the bottles preserved as well. 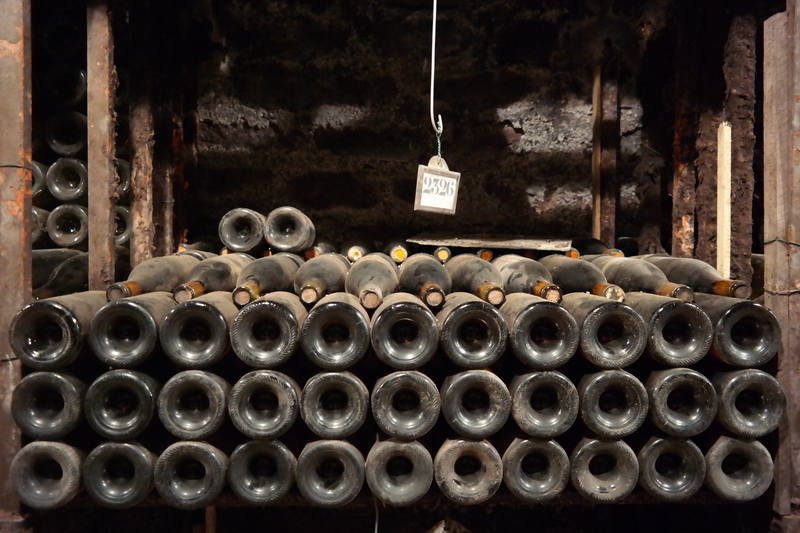 A reason why Bouchard still has bottled wines of the 19th and 20th century, is because they first of all can age them in the original conditions and they change the corks every X years (depending on the wine they do it more regularly, but mostly between 20-30 years) . 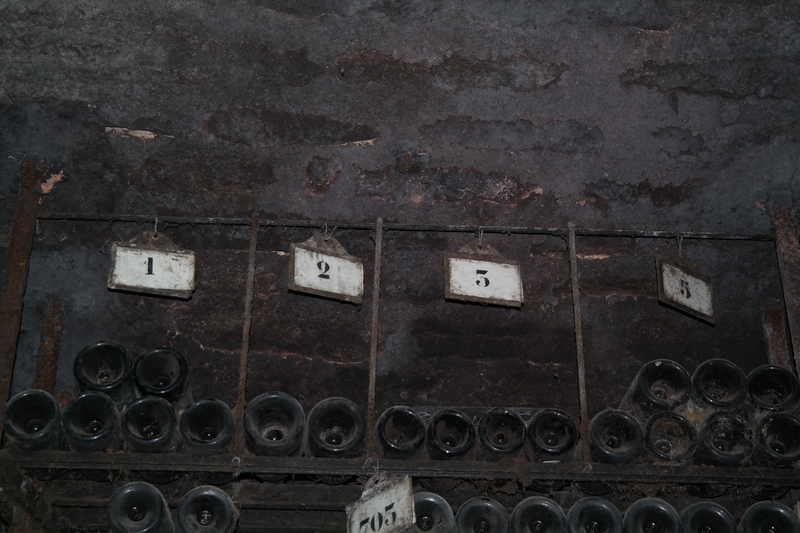 The moment they change the corks, they do check if the wine is still OK or not. 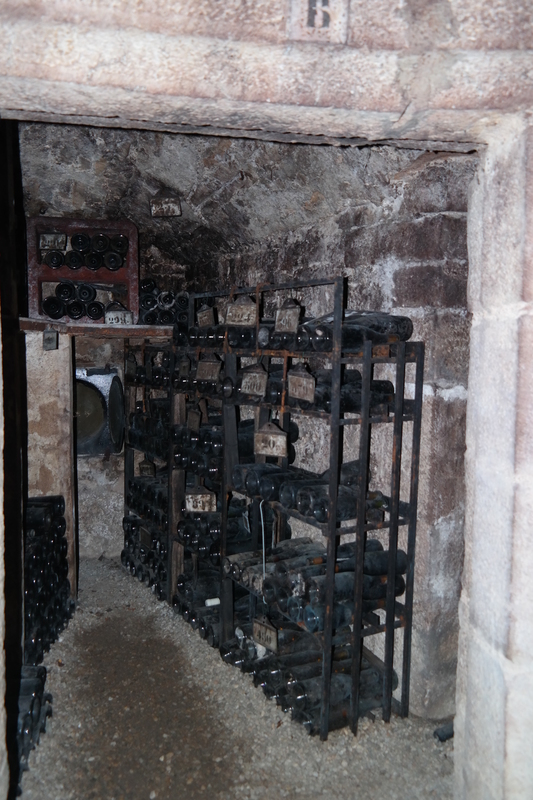 In case it is not OK anymore they don’t keep that bottle… this makes that the bottles they do still have are still good to drink… can you imagine to drink a wine from over 200 years??? Obviously this is only something a few fortunate people are able to taste, but still…. 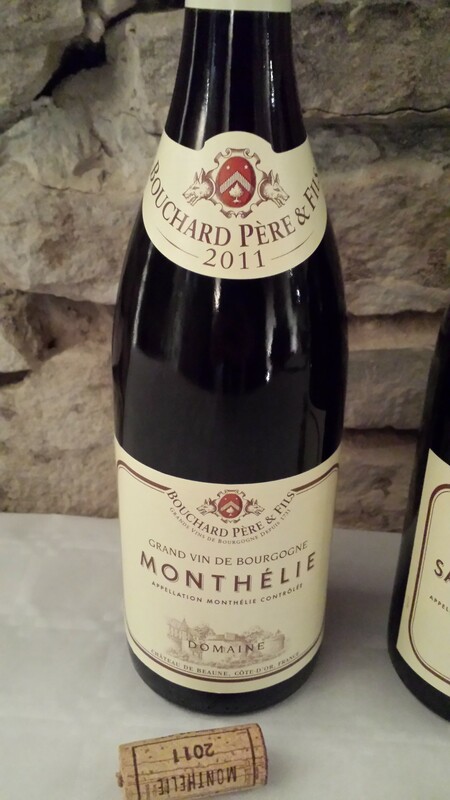 Already from the first sip I was converted into a Côte-d’Or Bourgogne fan… even the first, a 2011 Monthélie , wasn’t the highest level they had or more complex wine yet it was definitely my cup of tea :-). It was a very playful wine that everybody would like and is easy to drink and that leaves a very fresh fruity taste in your mouth. 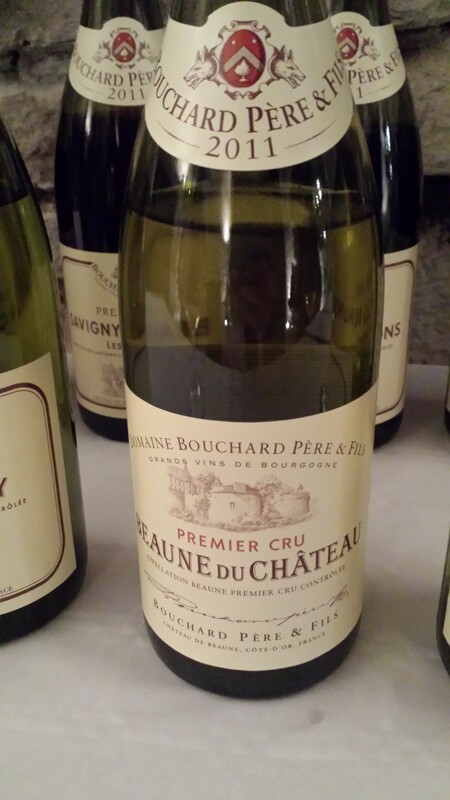 FYI all wines we tasted were 2011 Premier Cru’s (besides the first that is as that was an Appellation Village)… which proved (not that I needed it to be proved) I prefer the stronger/ more complex wines and that I am one spoiled brat :-). 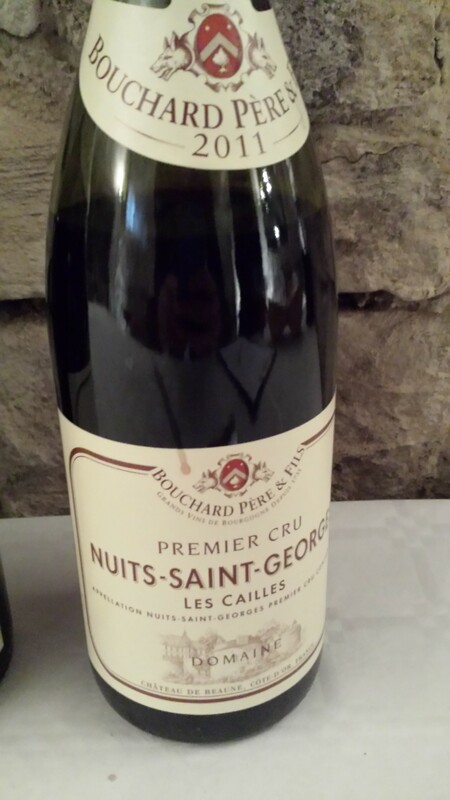 My Absolute favourite from amongst the red wines we tasted was the Nuits-Saint-Georges – Les Cailles Premier Cru with scent and taste of very ripe dark red fruits like cassis or bil/blue berry and even lickerish accents in it and yet very elegant to drink without too heavy tannins…. The second favorite would be the Volnay – Caillerets Premier Cru which is made from the Bouchard Family’s first and oldest vineyard… It must be said that these wines are best with a stronger meal and not really like a Monthélie that can be drunk on a summer’s day outside with some friends. 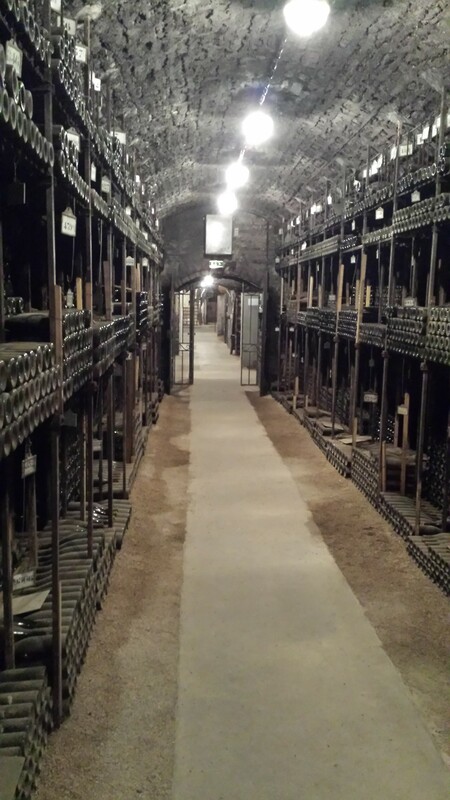 When tasting their white wines I started understanding why… the most famous white wines from this region that for sure ring a bell are Chablis (Chardonnay) or Pouilly-Fuisse. FYI not all chardonnay wine from this region is Chablis! What is nice about white wines, is that most of the time you can distinguish ‘easier’ what flavours or smells they have. Like the white variant of the Monthélie (and with variant I mean that you can drink outside on a sunny day with friends) would be the Bourgogne Chardonnay La Vignée where you can find hinds of peach and pear. Again here my preference went to the stronger whites. 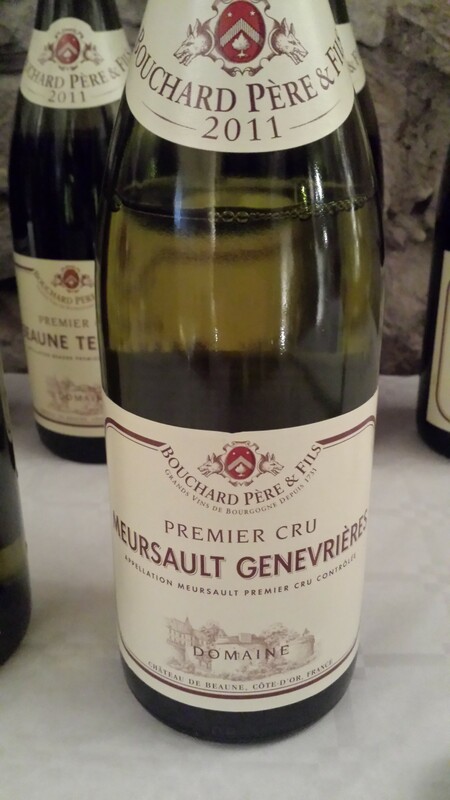 Number 1 would be the Meursault – Genevrières a rich wine with hinds of vanilla, wood (not too much) that can still ago for 8 years and would be a perfect match for foie gras or poultry. 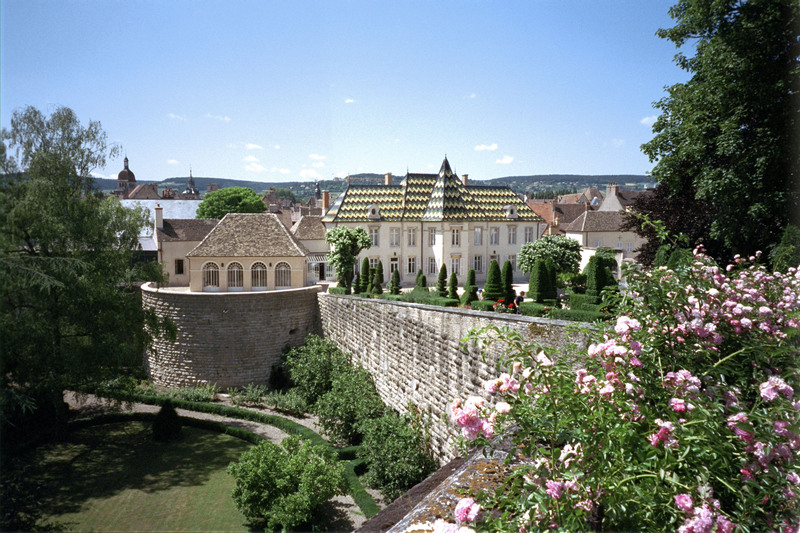 N°2 and 3 would be the Beaune du Château Premier Cru (Marzipan, almonds, grilled bread) and the Montagny Premier Cru (Honey). I could keep talking about how they taste or with what they would go well, but there is only 1 way to find it all out yourself and that is by tasting it yourself (I know I say it every time, but it is true). Also I think this post it more than long enough and I hope you already learned something 🙂 BUT there is still more to learn! !